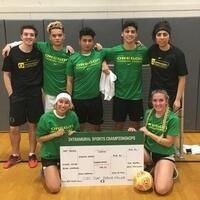 If you are interested in playing in our Intramural Sports 5x5 Indoor Soccer League please send a team representative to the mandatory Captain's Meeting to learn important information about the league. We will offer men's, women's, coed and Unified leagues. Unified Sports is an anwesome new program where UO students play with local, adult Special Olympic athletes !